I have wanted to do a top 5 series for a while so i thought i would get the ball rolling and show you my top 5 products taking me from day to night. Today i have a post on 5 products that can take my daytime look into night time. My day time make up is simple and not very unadventurous but for a night out i go all out and it is time to bring out the bright lipsticks and smoky eye! 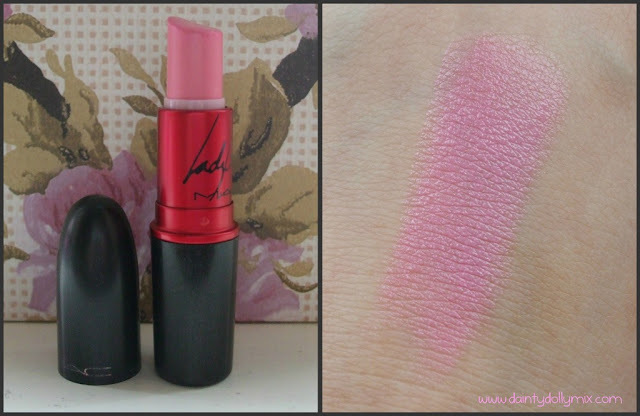 Heres 5 products that can take my day make up into the night! As i said above, day eye make up would consist of a wash of one eyeshadow colour only, usually a muted neutral such as 'Sin' from the naked palette, however on a night i like to shake things up a bit and use 'Sin' all over the lid, 'Sidecar' in the crease and 'Smog' in the outer V of the eyelid. Absolutely love this palette and couldnt recommend it enough! For day time, i use a liquid eye liner to line the upper lash line and leave my waterline bare as i think this looks a bit too much for day make up, however on a night i can transform my eye make up by adding the Benefit Bad Gal eyeliner to my water line, it darkens up my eye area and paired with the smoky eye is perfect for a night out! The Viva Glam Gaga lipstick is a gorgeous bubblegum pink which is perfect for night or day but the reason why i have put it in my top 5 products to take me from day to night is because it can be worn muted through the day for a sheer pink lip colour or can be worn much heavier on a night for a bright barbie pink lip, one of my favourites to wear on a evening. 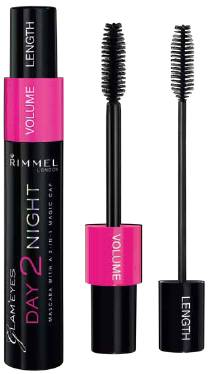 The Rimmel Glam'Eyes Day 2 Night mascara is a perfect product from taking your make up from day to night in one product! It consists of a tube with one wand but with two different results. For day time the 'length' can be used to lengthen the lashes for a less dramatic look whereas 'volume' can be used on a night to make the lashes look thicker and more volumised. When using the length cap the wand is quite long and thin so its perfect to work the mascara into your inner corner lashes. For a fuller night time look (which is what i like) you can even use the length cap first followed by the volume cap. I love the concept of this mascara and it is definitely a cheaper alternative for the MAC Haute & Naughty mascara. As you can see from above, the length cap really gives the lashes some length without much volume and the volume gives a much fuller, thicker look. The actual mascara isnt too wet which i like as it doesnt smudge and dries pretty much instantly. I really love the consistency too because its not a dry product and coats the lashes really well. I really like this! It is available to buy from here for £5.99, an amazing price! Porcelain pink is a product i dont use too often as i find it a little shimmery to get away with wearing in the day as i dont usually highlight my face for a day time look but on a night i whip out the shimmery highlight and porcelain pink by MAC usually compliments my make up and skintone nicely. What are your 5 products that take you from Day to Night? I Love the Naked palette! im currently trying to get hold of one! but i dont want to pay full price! they are sooo expensive! that mascara looks like it does a great job! I need a good mascara so think ill be purchasing this one on the weekend. Brilliant idea for a post! 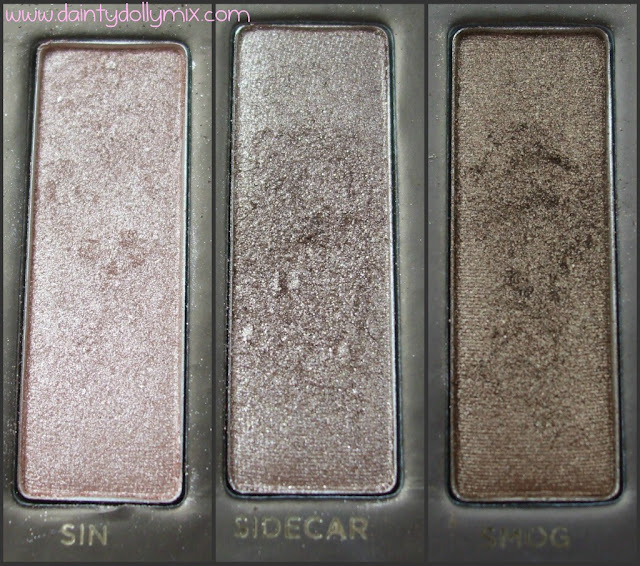 The MSF looks so pretty, and I totally agree about the Naked palette- couldn't live without it! I Love the naked pallet and i really want to try out the bad gal liner from benefit! Looking forward to your summery nail varnishes today. I love top 5 posts they are good at getting to know the blogger better and of course are useful for finding some really good products! I have heard so many great things about the naked pallet! I really want one myself now! Whats in my travel makeup bag?